Dimensions of Fortnite Birthday Party Banner is 1.2 metre in Length x 300 mm in Height. Mark your Special Fortnite Birthday Party with a unique and personal touch with our party invitations. All our Invitations are printed on 440gsm vinyl banner. 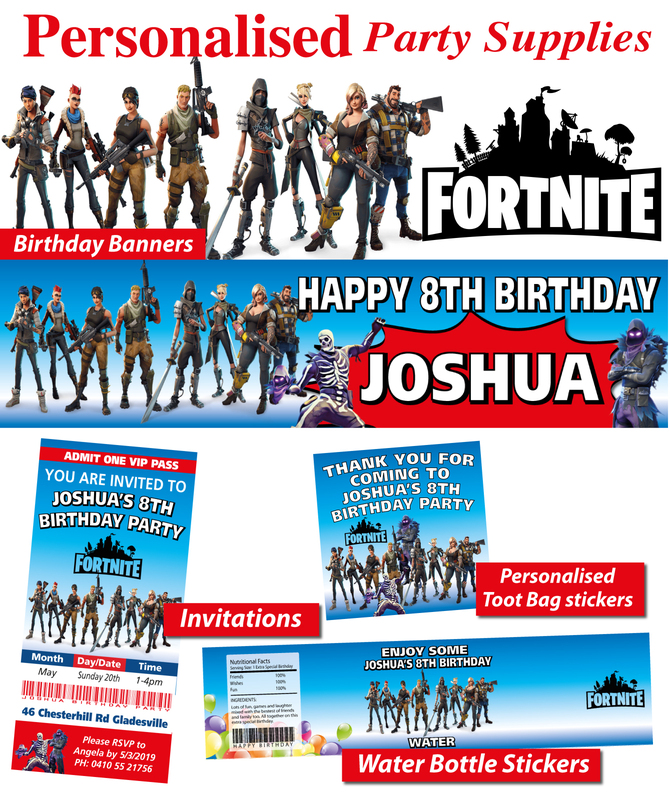 Professionally printed Fortnite Birthday Party Toot Bag Labels. All our thank you stickers are printed on professional Waterproof vinyl stickers. Professionally printed Fortnite Water Bottle Labels. All our Water Bottle stickers are printed on professional waterproof vinyl stickers. Perfect in every way. Fast delivery. My son was over the moon with his fortnite party. Click the button below to add the Personalised Fortnite Birthday Party Banner Decorations supplies to your wish list.